Yuriy Netesov. .:: includes as graphs ::. At some point of time you want to see the dependencies inside of your project. This can be useful for optimization of compilation times, and also from design perspective. One of the nice representation is graph where vertexes is files and edges is include statements. This representation is very powerful for analysis because it gives us the whole graph theory tricks to use. I have used it to find which files it is better and safe to include into precompilation header, and also to gain some nice overview of the project. I have ended with python + orientdb + gephi. My first try for our relatively big project was python + graphviz. I have failed with graphviz because it was trying to produce a png for 4 hours(4k vertexes + 30k edges). The second attempt was with graph database. I have decided that for analysis purposes it is a way better to load everything in database which allows you to do custom queries. So I took orientdb - installation very straightforward and the documentation is nice. I will use visualization of CPython project here. OrientDB allows you to do SQL like queries over its database and also have a beautiful one web client interface. It is document oriented db with possibility to store graphs. It can be schema-less, or you can create a scheme and use it. Classes is almost like tables in regular one SQL(actually it is not so, but for simplicity reasons lets assume it is so). It also have a nice one python bindings. "(select from cppfile where name='%s') set count='%s'"
The script accepts list of files in stdin. I have used multiprocessing for faster files parsing. Go to web interface and choose graph. Now we can make a traverse from a file to see who is including this file and how. And you will get a nice graph dependency for "util.h". But this can be very slow in case of many nodes. To display file names instead of ids just click on any node, click on eye icon(show), go to configure and choose name. 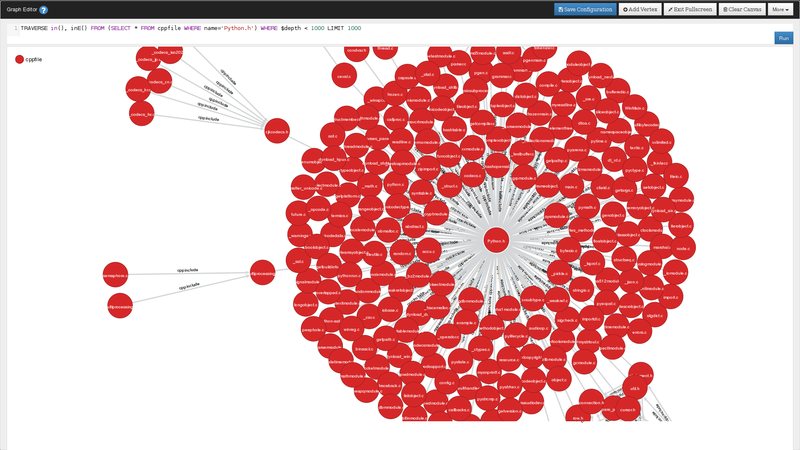 The orientdb web client is not good enough when it comes to visualization of big one graphs. Here you will need something more powerful. I have searched across the internet and the most suitable project I found was Gephi. 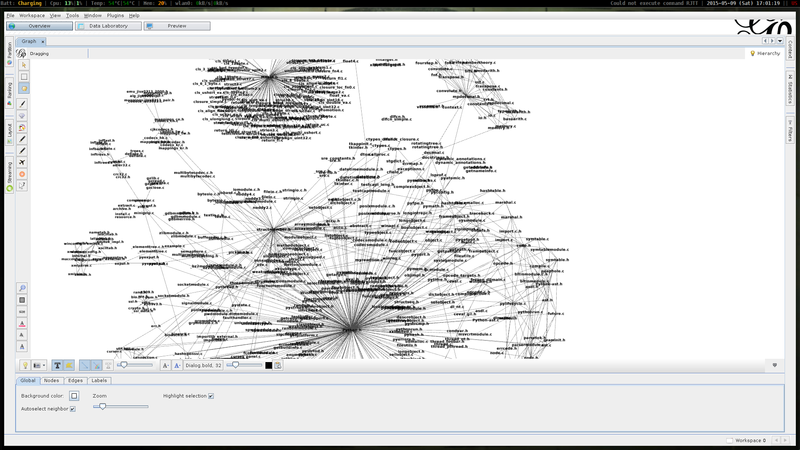 To connect gephi to orientdb we will need to install streaming plugin. You can also visualize traverses which sometimes can be useful.